Summary: New York Times bestselling author Dorothea Benton Frank returns to her magical Lowcountry of South Carolina in this bewitching story of marriage, love, family, and friendship that is infused with her warm and engaging earthy humor and generous heart. Over the next few weeks, you will be seeing a lot of "beach" book reviews here at Booking Mama. We were at the beach a few weeks ago and I read seven novels -- not all beach books, but a lot of them were! I'm trying to get them reviewed in a timely manner so I can help with your summer reading list. The very first one I picked up was SAME BEACH, NEXT YEAR by Dorothea Benton Frank. It's become a tradition of mine to read one of her books at the beach every summer. SAME BEACH, NEXT YEAR is about two couples who meet every year on the Isle of Palms with their families. The story follows them from the first summer when they met through the next twenty years, and it's full of secrets, romance, drama and more! Adam and his with Eliza seemingly have it all. Adam has a successful business, Eliza is a terrific mom to their young twin boys, and their marriage is going strong; however, during their vacation to the beach, Adam "runs into" his old high school flame Eve. (Yep -- Adam and Eve!) Eve is coincidentally at the same resort with her gorgeous (and charming) husband Carl, who's just happens to be a doctor, and their precocious young daughter. Eliza and Carl notice right away that there is something strange going on with their spouses (and a little spark between them too), but the couples forge a friendship anyway. For the next twenty years or so, the couples return to the Isle of the Palms to spend a few weeks together; and they continue to get closer and closer. They eventually even buy condos right next to each other. Both families experience quite a bit through the years as their children turn into adults and the adults become empty nesters. Through it all, their friendship is at times tested; however, in the end, they find that their love for each other surpasses any of the tragedies they faced. I remember reading SAME BEACH, NEXT YEAR on a gorgeous day in the Outer Banks, and I couldn't have had a better setting for reading this novel. 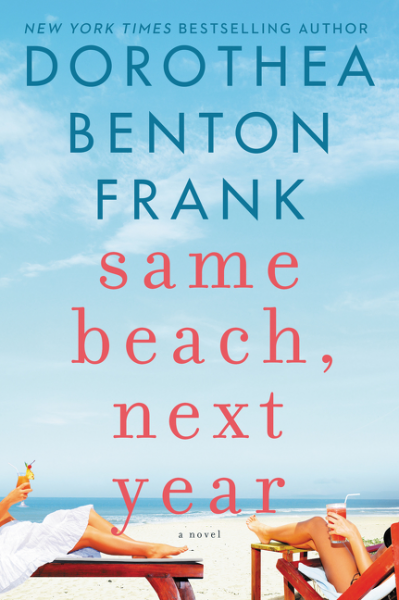 I read a Dorothea Benton Frank novel every summer, and I think SAME BEACH, NEXT YEAR is my favorite of the past few years. I enjoyed the characters in this book, even when I wanted to shake them; and I loved the settings of the South Carolina low country and Greece -- yes one of the characters travels to Greece! It was a great summer read, and fans of Ms. Frank are going to love it! I'm sure you can tell by my description that these couples' marriages are challenged. Just imagine if your husband's ex girlfriend showed up at the beach one summer with no warning. I'm not sure I would have been quite as understanding as Eliza was. However, I grew to appreciate these characters, even their flaws; and it was extremely interesting to see how their relationships evolved throughout the years. I especially appreciated the character of Eliza. I admit I was startled as to her initial reaction of Eve showing up at the beach. However, throughout the course of the novel, Eliza definitely became her own person. I loved that she decided to travel to Greece (on her own) to see discover and get in touch with her roots. Of course, it didn't hurt that it was extremely fun to read about the amazing people and the wonderful foods and drinks she experienced during her trip. As interesting as these characters were to follow, there were times that I had to wonder why their friendship was going strong after all these years. I mean there was just a little too much attraction between the couples for me. However, when a few of these characters hit rock bottom or had life-threatening health issues, the strength of the friendship really became apparent. And that's what I enjoyed the most about this novel. Love, family, and friendship were the central points of this story! SAME BEACH, NEXT YEAR would make a fun book club discussion. There are quite a few topics to discuss as evidenced by this reading guide. Some of the themes you might want to explore include marriage, trust, secrets, love, addiction, priorities, friendship, and forgiveness. If I were hosting book club for this novel, I'd be sure to have lots of Mediterranean goodies to eat and drink! All in all, I enjoyed SAME BEACH, NEXT YEAR and think it's a great addition to your beach or pool tote this summer! This sounds perfect for the beach! America produces so much good reads at this time of the year! I'm glad to hear I'm not the only one who coordinates their books to their vacation. I'm going on vacation in a few weeks and I've picked out three books that coordinate to where I'm going to be while on vacation. I love a good reading theme! Still another well-known author that I've never read. With all the reading I do, the number of nationally prominent authors I haven't read dwarfs the ones that I have.